NOTICE: The Benefit Charge Review Board will hear all Petitions for Adjustment of the Benefit Charge on February 25, 2019 at 10:00 AM and February 27, 2019 at 5:00 PM. When voters approved the creation of Renton Regional Fire Authority, they also approved the Benefit Charge, a segment of the two-part funding system that fuels the organization. Unlike the Property Tax Levy, which is based solely on assessed property value, the Benefit Charge is based on property factors such as building size, hazards associated with the building, and firefighting resources required. For that reason, it both stabilizes funding for critical fire and life safety services and provides owners a fairer way to distribute the cost for those services. Learn more about the two-part funding system that was approved by voters in 2016 and how the two parts work together to fuel fire and life safety services across the community. Monitored fire alarm? Automatic sprinkler system? Low income senior? Disabled persons? You may qualify for benefit charge discounts and exemptions. Do you believe there is an error in the calculation of your benefit charge? You can quickly and easily submit a petition online. The Benefit Charge provides a fair and balanced approach to distributing cost among taxpayers. For example, a building with a tenant storing combustible gas will pay more than a building running a small office, even if those two buildings are assessed at the same value. The building storing combustible gas has a much higher associated hazard and would require more firefighter resources in case of emergency than the office building. The benefit charge places more cost on the part of the building that carries more risk and resource requirements and less on the building where associated hazards are much lower, thus the required resources to protect it are lower. Construction is finishing up on Fire Station 15 in the Kennydale area of Renton, and Engine 15 is already in service, which drastically improves response times to the area and relieves pressure from surrounding stations. We were been able to maintain and ensure adequate staffing throughout the organization, including hiring 15 new firefighters. We added a professional Public Educator to help improve the safety knowledge of the community through proactive public education. Enhancements were made throughout the organization that upgraded the Fire Protection Class Rating in Renton beginning in 2019. This upgrade can result in savings for community members throughout Renton on their property insurance premiums. We implemented the Pre-incident Planning Program to further improve the speed and efficiency of emergency responses. The Office of the Fire Marshal performed over 5,000 fire inspections to help keep the community safe. The Benefit Charge applies to all buildings on the property over 400 square feet in size. Measurements are determined based on gross square footage (measuring the outside of the building). It includes each level of the building(s), basements (finished and unfinished), mezzanines, garages, and any other structure that meets the 400 square foot size. 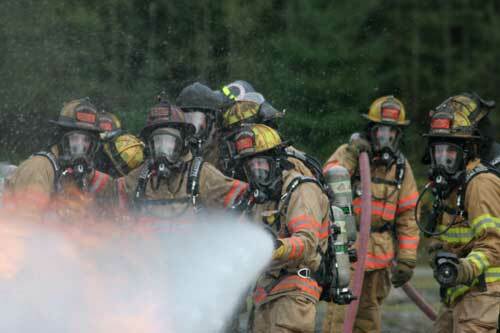 Up to 60% of the Renton Regional Fire Authority budget can come from the Benefit Charge. The rates for the charge are set each year by the Governance Board as part of the annual budget process. Every six years, voters have the opportunity to reauthorize the Benefit Charge with majority voter approval. What is the Benefit Charge? The Benefit Charge is one part of the RRFA’s two-part funding system. It is a fee that is included in your property tax which is payable to King County. It is identified as “Fire Fee” on your property tax statement. A Benefit Charge of up to 60% of the operating budget, which can only be used for day to day operational expenses such as salaries, equipment, fuel and utilities. The benefit charge is not a per call charge and is not based on property value. The benefit charge is a fee, which is based on the benefit of having fire protection. The benefit charge applies to structures 400 square feet and larger and is collected by the County Treasurer’s office along with the property tax bill. What are the factors used in determining the Benefit Charge? Category Factor – The category factor is based upon building use and size (residential, mobile homes, apartments, commercial). This information is obtained from the King County Assessor database for each building subject to the benefit charge. Fire Flow Factor – The relative cost of providing the required fire flow per gallon during a fire incident. Effective Response Factor – The effective response force factor is relational to the size of force in firefighters and equipment required to deliver the required fire flow. Hazard Factor – The hazard factor represents the degree of risk caused by the use, processing, or storage of hazard materials with a building. The hazard factor reflects the need for larger and/or more specialized effective response forces. Hazard factors are determined from use and risk classifications found in the National Fire Protection Association (HFPA) Standard 13 (Standards for the Installation of Sprinkler Systems), and are applicable to commercial properties only. a. A 30% increase when products or uses with high combustibility or high rates of heat release are present. b. A 40% increase when products or uses with high quantities of flammable, combustible or hazardous materials are present. No surcharge will be assessed on light and ordinary hazards. What if the notification letter I received has an incorrect square footage value? The benefit charge is calculated on the gross square footage (outside measurements) of all structures on a land parcel and includes each level of each building, and all basements, garages, lofts, mezzanines, carports, and accessory structures. Please make sure to factor all in to your calculations. How does the Benefit Charge help the average homeowner? As our population grows, the Benefit Charge provides a continued level of dependable fire and life safety services by maintaining well trained and equipped firefighters, fully staffed stations, and stations in areas that reduce response times to best serve you. Additionally, you now have a regular voice in the organization, including the Benefit Charge, giving you greater control over the cost of your fire and life safety services. What is the Petiton for Adjustment of the Benefit Charge Assessment process? In accordance with the provisions of Chapter 52.26.250 revised code of Washington, property owners have the opportunity to petition for an adjustment for the Benefit Charge Assessment. The petition deadline is 4:30 p.m. on February 06, 2019. Enter your parcel number where prompted. Review the parcel information that appears to ensure we have the right location. Complete the appeals form and upload any supporting documents. You will receive an e-mail receipt that your request has been received for review. Once your petition is administratively reviewed and a determination made, you will receive a notice advising the results of the determination. Download our petition for adjustment form (click here). Complete the form as it applies to you. Mail or deliver the form to: Renton RFA Benefit Charge, 18002 108th Ave SE, Renton, WA 98055. If you supply an e-mail address on your form, you will receive an e-mail receipt confirming your petition has been logged into the system, as well as your determination notice via e-mail. If not, these documents will be mailed to you. You will receive an e-mail confirmation that your petition has been logged into the system. Once a determination has been made, you will receive an e-mail notice containing the results of the determination. If you disagree with this Administrative Review, respond in writing to the Renton Regional Fire Authority Governing Board Secretary by 4:30 p.m. on Monday, February 18, 2019 and your Petition for Adjustment of the Benefit Charge Assessment will be docketed with the Benefit Charge Review Board. Send your request to: Renton RFA Governing Board Secretary, 18002 108th Ave SE, Renton, WA 98055. Be sure to include your name, parcel number, and property address in your communication. The final ruling by the Board will be concluded on March 11, 2019. Once concluded, you will receive confirmation of the Board’s determination. Who establishes the Benefit Charge and what does it cover? RCW 52.26.180 provides that the Regional Fire Authority may fix and impose a benefit charge on personal property and improvements to real property. The benefit charge does not apply to land. The benefit charge would cover such property as residential buildings, commercial structures, agricultural buildings, and other structures affixed to the land. How long is the Benefit Charge good for? Every six years, voters have the opportunity to reauthorize the benefit charge with majority voter approval. Current authorization extends through 2022. In addition, the state law requires annual public hearings prior to the next year’s rates being adopted. Hearings are held prior to November 15 each year, by the Renton RFA Governance Board to establish the benefit charge. After the benefit charge has been established, property owners subject to the charge will be notified of the amount of the charge. The Governance Board will form a Review Board for at least a two-week period to review petitions for adjustment from property owners. The final benefit charge will be added to the property tax bill.